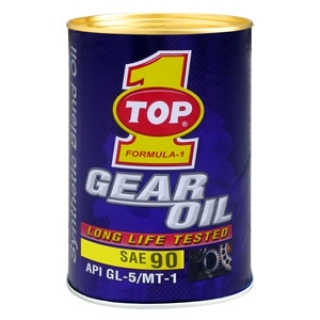 TOP 1 GEAR OIL MB 90 is a high quality, synthetic, multipurpose gear lubricant designed specifically for high performance automotive applications. TOP SGO MB90 is formulated with SYNGEN 2000 base stocks and is compounded with a unique extreme pressure additive package. The outstanding thermal stability minimizes oxidative sludge and varnish formation for longer gear, bearing and seal life. TOP 1 GEAR OIL MB 90 is ideally suited for all types of automotive and industrial bearings and gears, and particularly those operating under severe temperature and load conditions. TOP 1 GEAR OIL MB 90 is also suited for use as a "top-off" of limited slip differentials and provides excellent protection in the presence of small amounts of water. Extended gear life EP additives for wear protection Good rust protection Compatible with other automotive gear oils Improves fuel economy Long lubricant life Very high VI for wide temperature operation Non-corrosive and foam resistant.